Mr. Turing, I’m all ears. This is my review of The Imitation Game! The Imitation Game is the true story of Alan Turing, a mathematician, cryptanalyst and eventual war hero who broke the unbreakable war codes of Nazi Germany’s Enigma machine. So this was the highest grossing independent film of 2014 and frankly, all of that money is well deserved because this is an excellent film. I have nothing bad to say about this movie, so here is everything right with the Imitation Game! I want that soundtrack! The musical score is haunting and hypnotic. Heck, I can still hear it in my head hours after the credits roll. In fact, I’m listening to it on YouTube as I write out this review (it’s playing on my tablet). It’s the kind of music that I would want to listen to while walking at the park or jogging around my neighborhood. 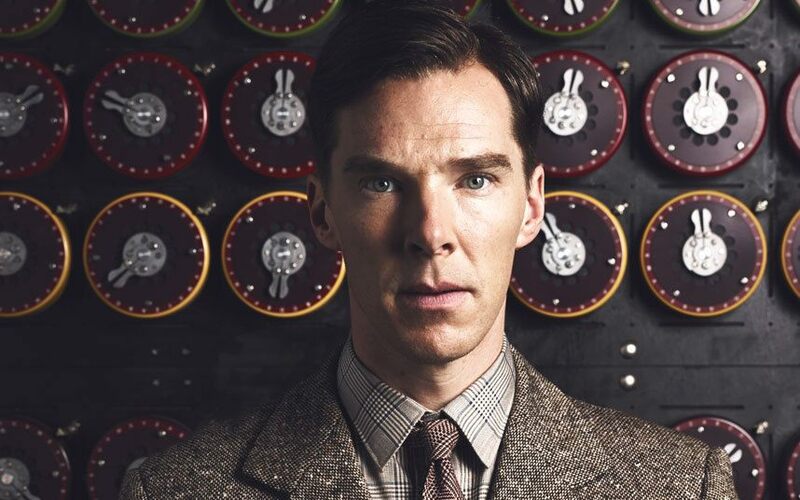 Like Bradley Cooper in American Sniper, Benedict Cumberbatch is mesmerizing as Alan Turing. This is a man who is lost in his own head, expressing himself through codes and calculations. An antisocial and off-putting man who is never intentionally hurtful, machines and mathematics are his true love, making more sense to him than the emotional responses of others. His ideas are so complex that not even people who are as smart as him have any clue as to what he’s talking about. This prevents the clichéd “he’s a misunderstood dreamer and everyone else is a jerk who doesn’t get him” trope. Benedict Cumberbatch’s thoughtful performance portrays Alan Turing as someone I would want as a teacher or a mentor. Keira Knightly is wonderful as Joan Clarke, who shares a chaste, emotional connection with him. Alan and Joan never touch in a sexual way, yet their souls speak to each other through their intellect. Their last scene together is heartbreaking as we see these two bright people allow themselves to be vulnerable and emotionally-naked with each other. Ever since I reviewed Right to Believe, I always pay close attention to the portrayal of a homosexual character; is it sensationalized or handled with tact and grace? Does it define the character or is it only an aspect of a three-dimensional protagonist? Is the LGBT character written as a human being or an agenda pawn? By this litmus test, the Imitation Game passes the class with flying colors. His homosexuality is a subplot and never consumes the story. In fact, for a while, I thought Alan Turing was asexual (someone who does not experience sexual attraction; different from celibacy. http://www.asexuality.org/home/?q=overview.html ) I like how the subject of homosexual men marrying women is treated as the complex matter that it is; neither Alan nor his fiancée Joan is vilified. He deeply cares for her, but feels conflicted; she genuinely loves him as her closest friend, but societal norms mandate her to be married. Overall the film gives us a sense of what it’s like to be Alan Turing; the script is so intimate with the main character that it’s like the director and/or screenwriter personally knew Turing. Like Amelie and American Sniper, the Imitation Game knows its protagonist and wants you to know him, as well. This is a humanistic film that tells the story of a brilliant man who was forced to hide his sexuality from the very world he was trying to save. SPOILER CORNER!!!! IF YOU HAVE NOT SEEN THE IMITATION GAME YET, SKIP THIS SEGMENT!!! The ending got to me. I was disgusted at the way the British government treated him after he was arrested for gross indecency, for just being a homosexual. He was given two options: Two years in prison or chemical castration. He chose castration so that he could continue working. I mentioned Alan and Joan’s last scene together, which comes at the end before the text comes on-screen revealing Alan’s suicide. I bring it up because this is the scene that moved me the most. Alan tells Joan that he continues the government’s hormonal treatment so that he can keep Christopher, the machine that broke Nazi Germany’s Enigma. “If I don’t continue, they’ll take Christopher away from me and I’ll be alone,” he bursts into tears, “…and I don’t want to be alone.” Joan comforts him and suggests he do a crossword puzzle, his favorite hobby. When he struggles to lift the pencil and says, “I’ll do it later,” that’s when I knew it was over for him. Once the end text reveals that he killed himself at the age of 41, I started crying. To be driven to such despair is always a tragedy, but to do the courageous act of defeating Nazi Germany’s war machine and then be repaid with cruelty is equally tragic. Saint Edith Stein/Teresa Benedicta of the Cross, pray for us. < Previous Let’s Talk about Chastity!